When I started asking why spiders don't stick to their webs, the first explanation I found was that spiders spiders feet have oil on them. This seemed like a good explanation! Take a piece of sticky tape. Touch it. Your finger sticks to it. Now put a little oil or butter on your finger and touch the tape. What happens? Oily feet seems like a good explanation of why spiders don't stick to their webs. But then I wanted to know where the oil on spiders' feet comes from. For example, we have tiny glands beneath the surface of our skins that produce oil and sweat. Do spiders have little oil glands in their feet? Or maybe spiders find something oily and rub their feet on it! Well, it seems no one has ever found anything on a spider's foot that can produce oil. And no one has observed a spider oiling up its feet. Maybe the answer about spider feet was not as simple as it seemed at first. So I kept on looking. I found something that spider experts agree on. It's that spiders make many kinds of silk. Spider silk comes out of the spinnerets you can see here. 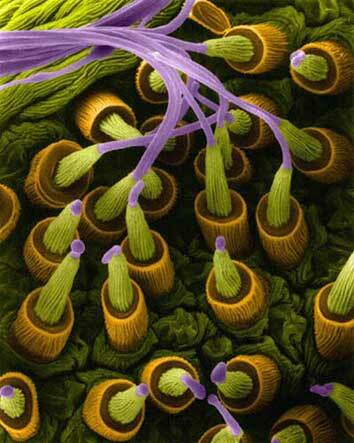 Spinnerets produce different kinds of silk thread. Some threads are sticky, some aren't. Several kinds may be used to build a web. Some threads are used to wrap spider eggs. Other threads are used as escape ropes or as trails. Not all parts of a spider's web are sticky. Some people watching spiders have noticed that spiders walk only on the parts of their web that are not sticky. Now that's interesting -- it comes from what people have been watching closely. This began to sound like part of an explanation. As he came to understand how a spider's foot works, he saw that the little claw in the middle held the sticky silk away from the claws the spider uses to walk across its web. Then the spiny hairs shove the sticky silk away from the middle claw. Maybe this is the answer to why spiders don't stick to their webs. Or maybe the answer is more complicated - or more simple. I'm going to keep on looking! So when you read some explanations on this web site -- or anywhere else -- remember that there's always more to know. An answer is often a starting place for even more interesting questions.